Growth teams rely on Funnels to analyze how many users convert on a particular step and how many drop off. But it is often difficult to find what users did after they dropped off. Did they not find what they were looking for? Did they get stuck at the checkout? What prompted them to leave the app? While Funnels are great at showing conversions and drop offs between two steps, wouldn’t it be helpful to view all the paths users take after or before a particular action to optimize conversions across the entire app? What if a single view could show all the frequented paths without trying a number of combinations manually? As a business, you want to make sure users do not hit any dead ends or roadblocks on your app. That’s what makes Flows so useful. 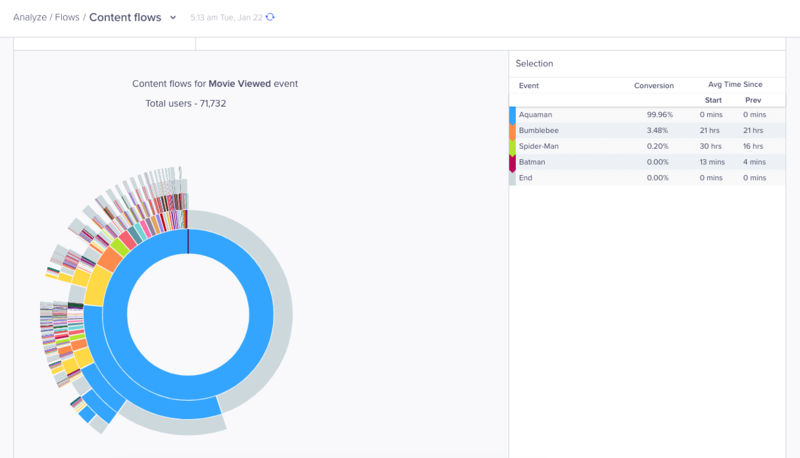 Flows helps you visualize exactly what users did before or after an event, taking the guesswork out of Funnels. For example: what series of actions led users to make a purchase? Or what did users do right after they launched your site? Knowing the different paths users take helps you identify friction points and optimize their path to conversion. It also helps you test new features, products, or functionality to assess how users navigate your product or site. A Flow path analysis may show the following series of events right before users hit that subscribe button. This Flow tells you that users are able to browse through the content library, find a title they like, watch the video, and eventually make up their minds to subscribe to your service without getting stuck. 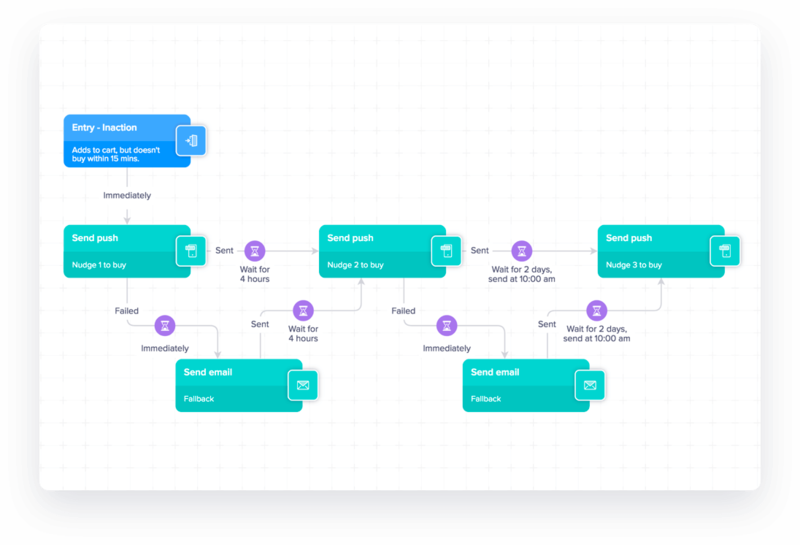 We call this an Event Flow as it maps out a series of actions (or events) that a user performs before or after a conversion event such as subscribe or buy. While Event Flows are super helpful, what if we could somehow determine what kind of content, product, or webpage they visited before or after performing a specific event? For example: it would be immensely helpful to know what type of content users who choose not to subscribe are interested in. This way we can demonstrate the value of the site by suggesting the selfsame content they’ve told us they enjoy. What did my users watch after the movie Avengers? Which products did users search for before looking at the newly launched Jordan hoodie? Once we can identify the genre / type of content users like, the time of day / days of the week they usually visit, plus popular search terms and titles, we can tailor their experience by recommending the content they prefer. Optimizing their browsing activity and bringing them closer to the content or product in a shorter amount of time is bound to significantly improve their experience. Not to mention positively impact your marketing ROI. Each concentric circle in the Flow view shows a different path that users took. And hovering over a given path tells you how many users took that path. What Makes Flows the Best Path Analysis Tool Out There? 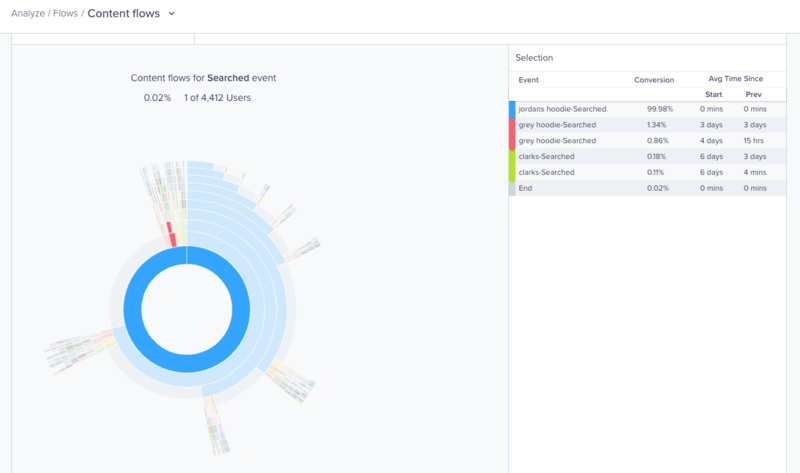 Similar to Event Flows, Content Flows can be used to analyze what users did before or after an event and can be split into event properties so you see a more granular sunburst chart with multiple possible values of an event. A great example: you just launched a new category of products and you want to know what people are doing prior to or after searching for specific products under the new category. Say you have a mobile payment app. You want to understand what are the most preferred loyalty cards used on your app and the most frequent purchases made on each of them. For example, mobile payment apps such as PayPal allow users to add retailer such as Starbucks, CVS, Target and others so users can make transactions directly from their smartphones. Flows allows you to limit your analysis to the top n values of the stated event property so you can quickly identify the most popular loyalty cards used, and send targeted cashback/discount offers to users to keep them engaged. Flows spans through sessions of your app and site as it takes the entire time duration of your analysis – for example the last 30 days. However, if you want, you can limit your analysis to contain only those users who completed the given set of actions within a specific time window. This helps further streamline your analysis. For example: for users who viewed movies in the action genre in the last 30 days, identify those who completed the Black Panther movie in the first week as a target audience for an ad about Avengers: Infinity War. Flows allows you to apply a specific segment of users that are on the verge of churn so you can be proactive about improving their experience. 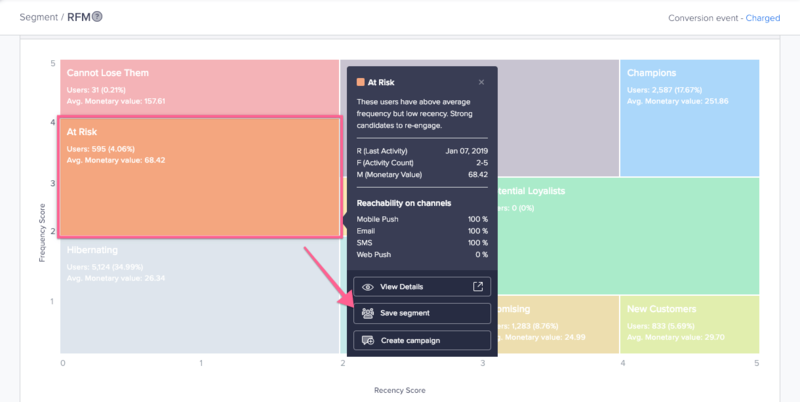 Use Automated Segmentation with RFM Analysis to instantly identify “Champions” and “At-risk” users and create a segment right inside this RFM visualization. With Content Flows, you can compare how the two segments navigate through your site. All you need to do is enter these segment when you start your Flows analysis. By comparing the two Content Flows, you will be able to clearly see the conversion path of champion users, the search terms they use and the content/products they navigate on the app. This helps you make relevant product/content suggestions to the at-risk users’ to optimize their experience and bring them on a similar conversion path as the champion users. As described above, by using event property split and selecting the “Top N” values filter in Flows, you will be able to identify and limit your analysis to the most frequently visited content or product pages on your site. This analysis also tells you which product has the highest drop-off rate so you can tailor your marketing efforts with products that are more popular. Use a marketing automation workflow such as Journeys to send relevant product offers based on these insights. Since Journeys also uses real-time triggers to send live user action based messages across channels, you can pick the most relevant messaging channel such as a push notification, email or app inbox message to tailor specific content types for each user segment. Example: users interested in a laptop may want to see configuration details alongside different laptop images and may best be served via email. Whereas those looking to buy shoes can be sent a targeted message in their app inbox with a coupon code they can redeem the next time they visit the app. Flows is available for all Enterprise accounts. If you have any feedback or would like to upgrade to our Enterprise plan to try it out, please contact sales@clevertap.com.